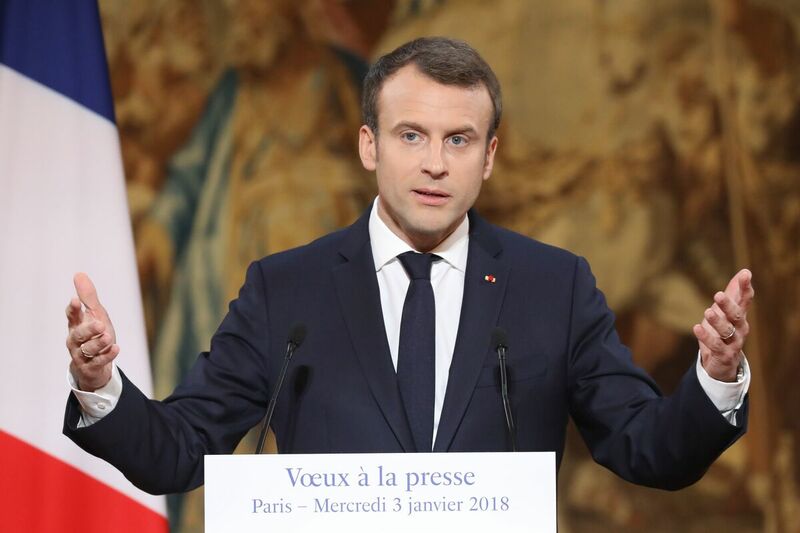 France's Macron Says He Wants Law To Combat Fake News : The Two-Way The French president says that during elections, the law would allow the government to block content deemed to be fake news and would force news websites to disclose their source of funding. French President Emmanuel Macron delivers his New Year wishes to the news media at the Elysee Palace in Paris, on Wednesday. French President Emmanuel Macron says he will push a new law aimed at clamping down on fake news, saying he hopes to have it in place by the end of the year. Speaking at a news conference at the Elysee Palace in Paris on Wednesday, Macron said such a law was essential, especially during elections. "The freedom of the press is not a special freedom, it is the highest expression of freedom," Macron said. "If we want to protect liberal democracies, we have to be strong and have clear rules." Adding that, "A law will follow in due course." Among other things, Macron said the law should require websites to disclose their source of funding and have a cap on the amount of money they receive from sponsored content. During an election, the government would be authorized to block a website to suppress fake news, he said. He insisted that press freedom could be preserved under such a law. Months after the U.S. election, which top American intelligence officials agree was manipulated by Russia, accusations began to surface that Moscow was trying to influence France's presidential election. In February, Macron — then beginning a surge in the polls against his pro-Russian ultra-nationalist opponent Marine Le Pen-- said his campaign was being targeted by Kremlin-supported media and hackers. The Washington Post notes that "On the eve of the vote, Macron's campaign suffered a massive cyberattack that it compared to the hacking of Hillary Clinton's presidential campaign last year. U.S. intelligence agencies have blamed that operation on the Russian government."